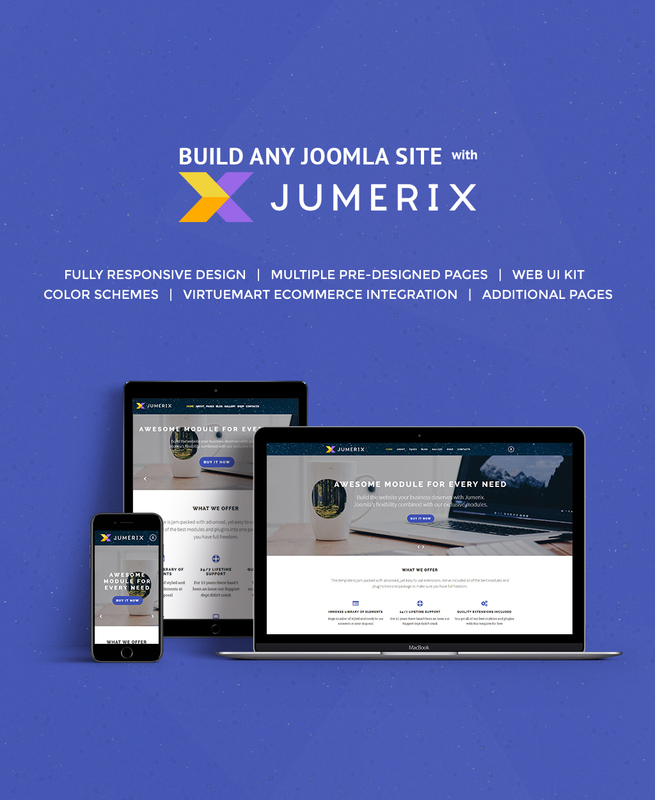 Jumerix Multipurpose Joomla Theme is packed-full with an array of features that will match blogs, portfolios, business or corporate projects, as well as eCommerce sites of different niches. Developed with the best design practices in mind, the theme includes a host of UI elements to personalize and spice up your web resource. 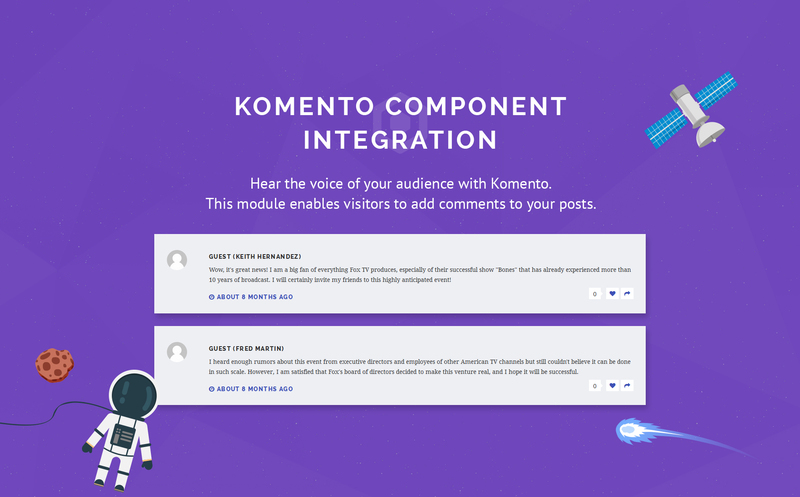 A set of TemplateMonster's custom modules and extensions is included into the theme for free. Also, the pack included pre-designed layouts that are ready to go live out of the box. It goes without saying that the theme is responsive and retina-ready. Live chat, commenting system, and built-in forum are available as well. MegaMenu and Ajax-based search allow the users to come across the desired content in an instant. By means of Bootstrap, you may make 100 % responsive online resources by means of HTML and CSS based layouts for typography, fonts, forms, buttons, tables, and so forth. Background video is a recent web design tendency where a video runs in the header of a website. Video Background makes your website more fascinating. It captures guests' attention, exhibits your company's style, and helps to improve user experience and involvement. Multipurpose WordPress theme is a template that thanks to its neutral looks can be a good option for any type of organization and purpose. Using a multipurpose theme, you may create and design content for all those functions. It is quite simple and valuable. It is an ability of the website to immediately adapt to any screen size and resolution. Mobile devices drive 80% of worldwide Internet utilization. It's critical to make your website responsive unless you want to lose your target audience. Parallax is a front-end visual method that involves pictures moving more slowly as opposed to the background to create a "depth" impression. Parallax scroll is visually beautiful and glues website users' eyes to the images and content modules. Portfolio website is a kind of website that lets presenting different items (services, works of art, products, etc). A well-made portfolio that presents the best work is a effective addition to CV. It reveals a work experience, a individual approach and, most importantly, talent. I have customized the Corporate Joomla template and would like to protect my content by copyright, can I place Copyright, Mycompanyname.com? After Corporate Joomla template purchase you can put your copyright to the template. But you cannot place a line at the bottom (or any other spot) of the customized project saying "Website design by Company name". Nevertheless, you can place "Customized by Company name". Make sure that these charges for Joomla theme for Business Blog have different order IDs. If it is so, contact our billing department. What is Extended License for Joomla theme for Business Blog ? Can I customize the Joomla design theme for Business & Services if that's required by application settings? Yes, you can customize the Joomla design theme for Business & Services code, graphics, fonts to any extent needed. Can I contact the Joomla design for Business Company author? Yes. You can contact this Joomla design for Business Company author/author's team directly using your personal account under the Support tab. Can I put a line at the bottom ( or any other spot) of the customized Joomla design for Business Company "Website design by Company name"? No, you cannot place a line at the bottom ( or any other spot) of the customized Joomla design for Business Company saying "Website design by Company name". Nevertheless, you can place "Customized by Company name". Will you help me to customize my Small Business Joomla theme? We do not provide any help or instructions on Small Business Joomla theme customization except for www.template-help.com help center. If you are not sure you can customize the template yourself we recommend to hire a design studio to customize the template for you. Are your Joomla themes for Business Blog compatible with any CMS? I like the image from the Joomla design theme for Business and would like to use it for my advertising campaign, can you send me this image in a higher resolution? No, we can't provide image in higher size or resolution rather than it is on the Joomla design theme for Business. We recommend looking for professional images on online photo resources. Can I get the extended license for some other pricing than the half of the initial Joomla theme for Businessman price? No. The price for purchasing license for a single Joomla theme for Businessman is the half of the template unique price. What is a unique purchase license for Joomla design theme for Business? If you purchase the product at a 'Unique price' it guarantees that you are the first and the last person to buy this Joomla design theme for Business from us. It means that this template has not been sold before and you become an owner of a unique design. After this kind of purchase the template is being permanently removed from our sales directory and is never available to other customers again. The unique purchase license allows you to develop the unlimited number of projects based on this template, but the template should be customized differently for every project. Are there any limitations on selling the Joomla theme for Business Bureau as the integral part of my new product? Can I customize the Corporate Joomla template? Yes, you can customize the Corporate Joomla template to any extent needed. You cannot use a header of the template for one project though, and images from the template for the other project. Can I put low resolution thumbnails of Business Joomla design themes on my website for my clients to choose designs? What are the advantages of purchasing a Joomla design for Business Magazine ? The major advantage of purchasing a Joomla design for Business Magazine is price: You get a high quality design for just $20-$70. You don't have to hire a web designer or web design studio. Second advantage is time frame: It usually takes 5-15 days for a good designer to produce a web page of such quality. Can I resell Joomla designs for Business Magazine I bought the developers license for? You cannot resell the customized Business Firm Joomla design theme as a template, but you may sell it as a project to your client. What is the difference between unique and non-unique Joomla design for Business Magazine purchase? Non-unique purchase:Non-exclusive purchase means that other people can buy the Joomla design for Business Magazine you have chosen some time later. Unique purchase:Exclusive purchase guarantees that you are the last person to buy this template. After an exclusive purchase occurs the template is being permanently removed from the sales directory and will never be available to other customers again. Only you and people who bought the template before you will own it. Will TemplateMonster help me to edit my Business Joomla design? TemplateMonster offers you a variety of sources to help you with your Business Joomla design. Use our comprehensive Online Help Center to get the basic knowledge about your Business Joomla design. Our Knowledgebase contains customers questions and most frequent problems. Anyway, you can always use TemplateMonster 24/7 phone support, try our Ticket System or Live Support Chat to get qualified assistance from our support representatives. What is a one time usage license for a Business Company Joomla template? When you buy the Business Company Joomla template at usual price you automatically get the one time usage license. It enables you to use each individual product on a single website only, belonging to either you or your client. You have to purchase the same template again if you plan to use the same design in connection with another or other projects. When passing files to your client please delete the template files from your computer. Can I integrate the Business Bureau Joomla design with third-party software or applications for development of my new products? No, you cannot get the developers license for development of Business Bureau Joomla design or other products. I would like to make payment for Joomla design for Business Magazine by company check. Is that possible? Please use Skrill payment option. They accept payments by check.You can place an order for Joomla design for Business Magazine on the site under the name of the company and choose Skrill merchant system for making payment from the company's account. To initiate bank transfer, please create an account here - www.skrill.com, add the number of your bank account and verify it. After that, you can place an order on our website and choose Skrill on checkout page. When the payment is made, the product will be sent to your e-mail along with the invoice under the name of your company. Is it possible to buy the particular image from the Joomla theme for Businessman ? No. According to our Terms and Conditions we never sell the images separately from Small Business Joomla themes (as well as the templates separately from the images). What am I allowed and not allowed to do with the Joomla templates for Business Company? 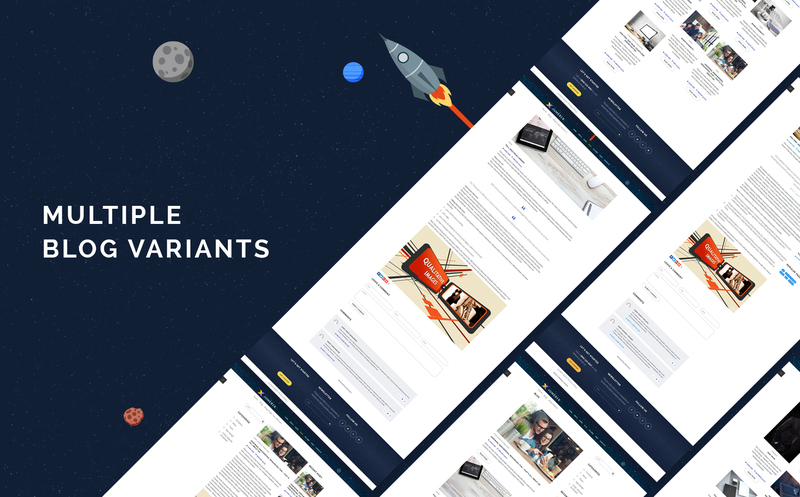 You may: Build a website using the Corporate Joomla template in any way you like.You may not:Resell or redistribute templates (like we do).Claim intellectual or exclusive ownership to any of our products, modified or unmodified. All products are property of content providing companies and individuals.Make more than one project using the same template (you have to purchase the same template once more in order to make another project with the same design). Nice template. I had little trouble finding all the modules to work but at last everything went fine. Excellent template from Template Monster. Good, addaptive template. Easy to use, easy to modify. I used this theme for a online training service. The theme was very easy to customize. I added few Joomla plugins for my purpose and they fitted well without any issue. I bought the installation as well and it ended smooth and with no problem. The customization of the template was easy even if not a Joomla expert. Above all I would recommend Template Monster staff and I&#039;ll use them again soon for my website projects. I purchased this template for a travel agency; all its features fit it perfectly, I recommend. I love the fact you can choose the color and that there are more than one home page to choose. The template is also easy to customize and no coding needed, plus Template Monster support live chat guys are so nice and they helped me on a few details. I purchased the developer&#039;s license because this is a multipurpose template and i&#039;m sure it can fit my next project! Difficult to know and understand what has happened and what to do. especially SQL. I can&#039;t use mod_icemegamenu to do as the same as in the demo website. After few days, I am still looking for the instruction and guess what happened. I asked the staff and they just send me the link of the tutorial. Just follow the tutorial. It seems helpless. I am so disappointed. La plantilla dispone de diferentes recursos que junto con los ejemplos que incluye la hace muy flexible y optima para una web corporativa. Nos ha gustado. I was looking for a futuristic and earth-based theme. When I saw the starry sky, I knew this would be the right theme. I was looking for a template that could easily be translated to promote a yet-to-be released novel, and a movie. Installation of the template was a slower process than I expected, however, I am satisfied with the level of ease it is to modify the template from the Joomla Dashboard. Overall, a positive experience. It&#039;s a excelente template for any services, It&#039;s a excelente template for any services, excelent, excelent, excelent!!! my web design agency has been working with templatemonster themes for 2 years already, checking out almost all of their new releases. 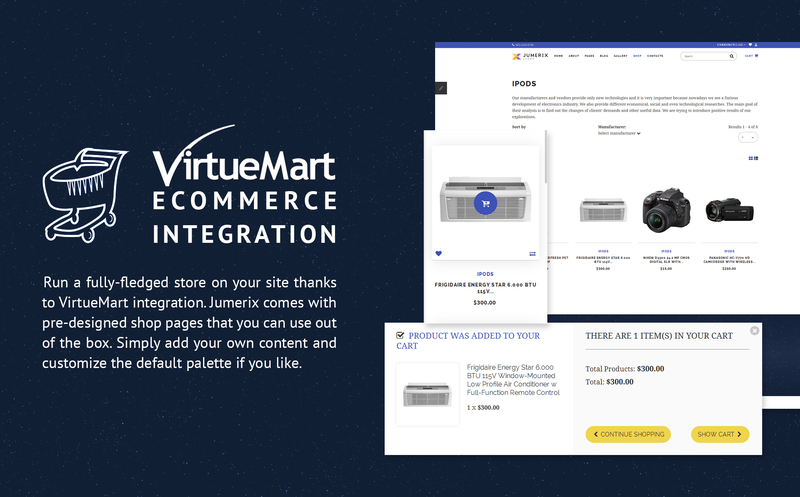 we&rsquo;ve used jumerix to build a construction business website and the working process was really smooth. nicely done! Its work with joomla last version too?. Or have to downgrade to 3.6 ?. Thanks. How to change background images on the Home page, like in the &amp;quot;HOW WE WORK&amp;quot; section? How to change icons in the &amp;quot;WHAT WE OFFER&amp;quot; section on the Home page? How to edit contact form on the Careers and Contacts pages? How to remove the TemplateMonster link from the footer and edit footer copyright message? I need a password to unzip the &amp;quot;sources_XXXXX.zip&amp;quot; archive from the template package. Where can I find the password? I need a module to show small images with links to other sites. What module can I use? How to display articles from a specific category in the accordion on the Careers page? How to change the slider dimensions?